So, what does the UK want on Brexit? Well, like that was a surprise. From pretty much the day the 585-page Withdrawal Agreement from the European Union (EU) was signed, British Prime Minister Theresa May was riding to nowhere. The only thing that came as any element of unknown was the sheer extent of the shellacking handed to her by the 432-202 division, so you can pretty much be assured that she had the backing of the 200 Conservative party members who gave their votes of confidence in her before Christmas, and two others. The question now is what’s going to happen. And no one wants to know that more so that the leaders of the 27 governments across the EU and the European Commission itself. May is to meet and consult with members of the opposition parties and is due to report back to the House of Commons on Monday as to how she wants to proceed. And the EU simply has one question: What does the United Kingdom want? Indeed, that’s the question that they’ve been asking for the past 20 months of negotiations: What does the UK want? Clearly, the straight answer is that it doesn’t want that Withdrawal Agreement — or the backstop element of it. That’s the long-term guarantee that will keep the border between Northern Ireland and the Republic of Ireland to the south open at all costs. 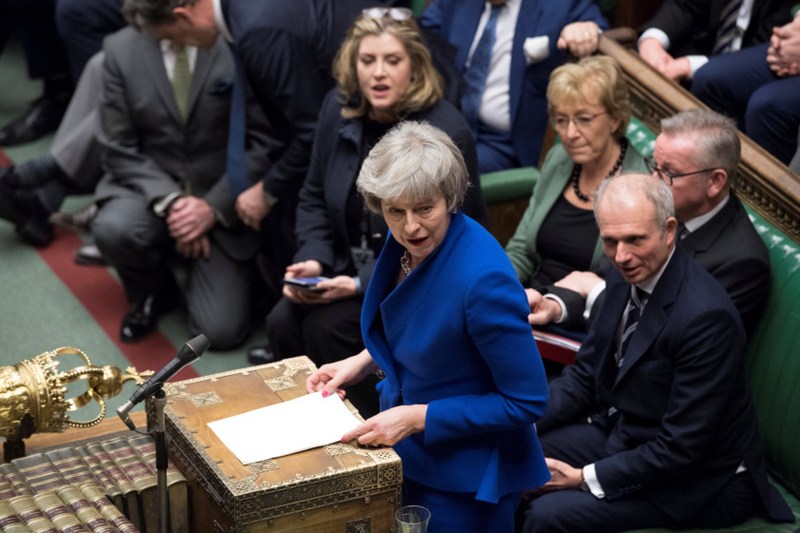 That’s a promise May had a hard time selling initially to her Democratic Unionist party allies on which she relies for her majority, but a necessary precondition for moving the talks onto to more substantial issues such as the trading relationship between the UK and the EU, of security, environment and financial services. Simply put, as far as the EU are concerned, any future deal with the UK has to include that promise, so that’s not going away. Clearly too, the UK needs to figure out once and for all if it wants to remain in a customs union with the rest of the EU. A customs union will prevent border checks and the imposition of tariffs, and will guarantee that UK car plants have parts, there’s food on shelves, and medicines in pharmacies. And being in a customs union that means the UK giving up on the notion that it will be free to trade and make trade deals with the rest of the world. The case for being in the customs union is compelling — open and easy access to a market of more that 500 million people that together make up the world’s third-largest trading bloc, guaranteeing jobs on both sides of the English Channel. What about the European Court of Justice? Being subject to its jurisdiction is a hard sell to Brexiteers who have campaigned long, hard and noisily about taking back control of its border. It’s hard to see that being part of any new withdrawal agreement as long as the UK gives a pledge that it will remain in general alignment with the principles of but not necessarily to the letter of European law. The free movement of people? This is a tricky issue, with Brexiteers adamant that it must be able to pick and choose who calls the UK home. Perhaps the way forward is to agree in principle that by the end of 2020, the UK will have the right to control its borders and set its own immigration policy — but that reciprocal rights for Brits living across the EU will be included. As it stands now, separate EU nations have made side deals acknowledging the residency rights of British nationals after Brexit takes place. Clearly, time in running out. According to the timetable, the EU and its 27 constituent members must ratify any withdrawal agreement in the weeks ahead to keep to the March 29 deadline. But with no deal now, that’s a tall order. There is a solution to this conundrum of the March 29 deadline, and that is to seek permission from the EU to extend that deadline. The practical difficulty is that European Parliament direct elections are set to take place across the EU27 by the end of May, with the new members of the European Parliament taking up their seats on July 1. Clearly, the UK cannot be part of that process, but the July 1 deadline does at least offer an opportunity for more time to cobble together a deal — any deal — to end this impasse. That July 1 deadline offers a chance too, should the UK decide that a second referendum on the EU question is needed to break this unprecedented crisis in parliamentary leadership. For that to happen, there has to be a deal — and there isn’t one right now. All there is now is that nagging question: So, what does the UK want?